Now and then in life something will spark a new desire. You may find you have a niche for something that you never new existed. This very thing happened to Cindy when her daughter-in-law gifted her with tools to begin creating jewelry. From there Cindy became so hooked that she started her own shop on Etsy to showcase all of her creations. CinLynn Boutique was born. 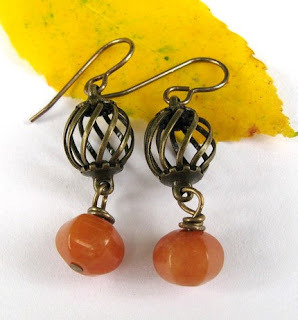 The antique brass globes and orange beads make these a perfect accessory long after your real pumpkins are gone. Not only are these perfect for fall, but the neutral colors make them a great choice for the rest of the year as well. 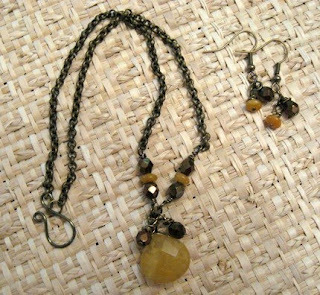 The yellow Quartz, wire wrapped brass wire and bronze faceted beads on this necklace set make these so easily wearable. This would make a lovely gift for someone! 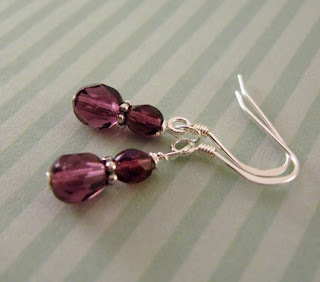 These dainty earrings are made from amethyst beads and sterling silver wires. What a popular color this season also! So I guess you all want an early Christmas present, huh? ;) Well, let's see if we can make that happen! This week our giveaway is this pair of turquoise with sterling silver bead balls and white Swarovski bicone beads. Hung on sterling silver ear wires they hang 1 1/4 inches. 1. Post a comment here about your favorite item from CinLynn Boutique. 2. Be or become a follower on Joy De Vivre Design and you will get a second entry. Friday is going to be super busy for me this week, so this means you guys can enter to win our weekly contest now until Saturday. Best of luck to all of you! Great blog and thanks for the giveaway! I love these sea earrings! what beautiful items!! I love the singing the blues earrings in the shop. I have purchased several items from Cindy. I really like her craftmanship and the quality of her jewlry.